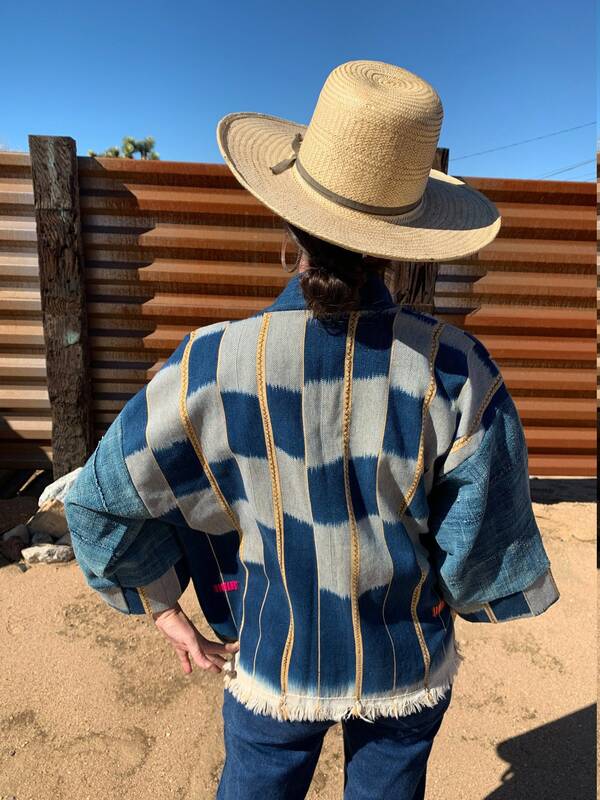 We chose this beautiful Indigo Ikat to create this one of a kind Haori style jacket. The vintage textile is so amazing and is made by the Baule people in the Ivory Coast of West Africa. The detail and craftmanship in creating these textile cloths is so inspiring, down to the hand braided detail at the bottom fringe hem. They are truly some of my favorite pieces of cloth to work with. The colors are a mixture of blues and cream with a soft yellow shade. We combined several other indigo cloths for the sleeves and bands to create a unique look. The jacket is a relaxed fit, one size fits all and unisex piece. These are old fabrics and need to be handled with care. Our goal is to support sustainable fashion by creating items from heritage textiles. From time to time you may need to give a few stitches to a hand stitched panel. We believe in living, loving, repairing and passing along.